Customize a party horn for easy, fun New Year’s Eve decor that will blow them away. 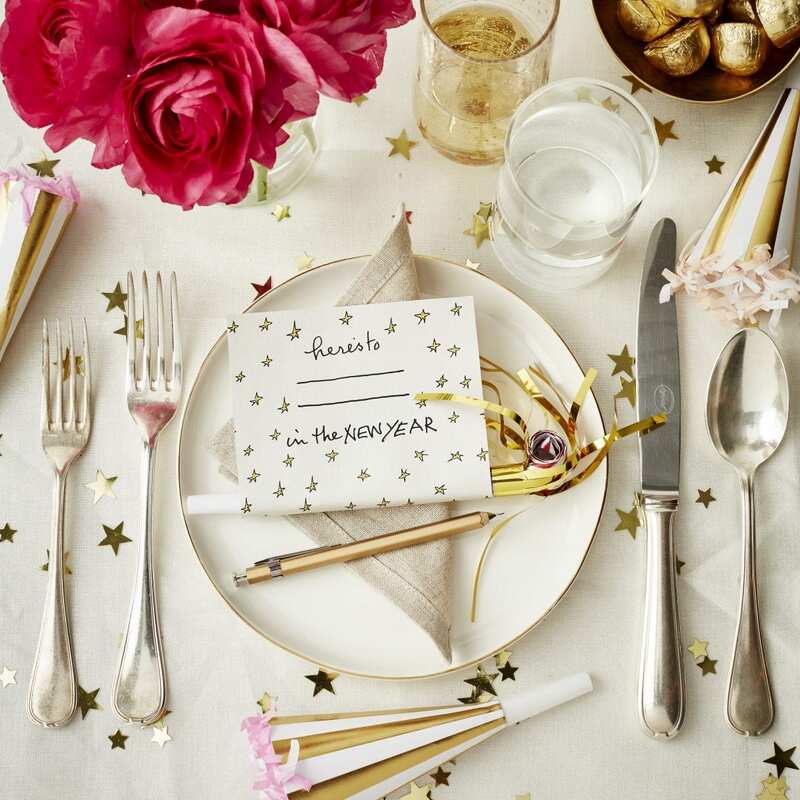 Wrap the blower with a card inviting guests to share their new year’s resolutions and pop one on each placesetting or set out on a tray to pass around before the clock strikes twelve. As everyone reads their resolutions aloud, the rest of the crew can blow their blowers in appreciation! And when it’s your turn, go ahead and toot your own horn—maybe it’s a good luck charm to make the resolution easy to keep! For a simpler (and quieter!) twist, forgo the blower and just cut out squares of paper for everyone to fill out. Step 1 Download Here’s the to New Year Resolution Card Template, print out on paper, and cut out. Step 2 Wrap paper around the base of the party blower so that fill-in-the-blank section is facing up—first tape the card to the horn and then attach both ends of the paper to each other with double-sided tape. Make sure to leave enough space on the blower so that it’s still usable! Step 3 Set out at each place with a handy pen or pencil, or leave in a bowl by the door so guests can grab them on the way in, fill out, and share before tooting their horns at midnight.